BBT IS NO LONGER PUBLISHING SRILA PRABHUPADA'S BOOKS, BBTI IS. BBT Bombay want to burn Srila Prabhupada’s Books! Prabhupāda: Oh. The definition of religion is just like law. Law can be given by the government. You cannot make law. If you make at home some law, nobody will touch it. It is not obligatory. But if government says "Keep to the right," it is obligatory. This is law. So religion, you cannot manufacture religion. Religion means the word of God. And if yearly or quarterly you change the words, that is not religion. That is not religion. That is mental concoction. Therefore we are presenting Bhagavad-gītā as it is. No change. Others, they are interpreting in their own way. That is not Bhagavad-gītā.That is something else. [to devotee:] Keep it there. He will take. In the words of God there is no question of changing. You cannot change. As soon as you make a change, immediately it is material; it has nothing to do with spiritual world. The same example = the law of government is one, and if you make change, that is not law. Government says "Keep to the right," you have to keep to the right. You cannot make "Keep to the left," no. That is nowadays happening = which edition of Christianity? There are so many. Therefore it is the purport of Christianity is lost. That is lost. You have, what that verse I wanted? Beautiful offering by Prabhupada disciple H.G. Jitavrata prabhu se from 36 minutes. WHY AM I LOOKING INTO THE BBT EDITING PROCESS? Commentary on "A Note About the Second Edition"
In this article we hope to bring to light how Srila Prabhupada, the Acharya and Jagat Guru, has personally instructed the proper etiquette to all his followers in how to deal with seeming mistakes, or errors in the writings of an uttama-adhikari and Acharya. The following is an excerpt from a long interview of Ramesvara prabhu made for Srila Prabhupada lilamrta. If you read the whole interview, you will find it full of nectar pastimes of Srila Prabhupada, but the interview, unfortunately, never made it to the lilamrta. Could it be because, there are passages like the ones underneath, that conflict with the interests of some influential people in ISKCON? The Vedic principle of Arsa - prayoga dictates, that you cannot find faults in or alter a spiritual masters text post-samadhi. You accept it - as it is - out of respect. "If one is too big, there is no mistake. Arsapreyaya means there may be discrepancies but it is all right. Just like Shakespeare..
Ishvara Puri also met Gadadhar Pandit and was pleased when he saw the depth of his renunciation. He started to affectionately give him lessons from Sri-Krsna-lilamrta, a book of his own composition. Nimai would also come daily to Gopinath Acharya's..
Prabhupada: That... Find this verse, munayah sadhu prsto 'ham... [SB 1.2.5]. 77% or 541 verses were changed out of 700 total. There will always be those who favor the posthumously edited edition, and there will always be those who favor the earlier edition that was read by Srila Prabhupada in classes, and in his lectures all over the world. Therefore, many people will present this perspective or that perspective, saying such things as.. If one is too big, there is no mistake. Arsha prayoga means there may be discrepancies but it is all right. Just like Shakespeare, sometimes there are odd usages of language, but he is accepted as authority. I have explained all these things in my preface to First Canto.” (Letter to Mandali Bhadra dated 1-20-72 ). CC mad 19.157 original edition: "If one thinks that there are many pseudo devotees or nondevotees in the Krsna Consciousness Society, one can keep direct company with the spiritual master, and if there is any doubt, one should consult the spiritual master." WHY IS BBTi HIDING THE NAME OF THE EDITORS. The revised and enlarged edition of the Bhagavad-gita As It Is (BGAII), as published by the Bhaktivedanta Book Trust (BBT) 1983, disregards the academic community’s protocols or standards governing the revised editions of the books. According to the guidelines now widely accepted and practiced by publishers and academicians, the names of editors and co-authors of such newly revised editions are to be included along with dates. THE DEFINITIVE ENGLISH EDITION OF BHAGAVAD-GITA. 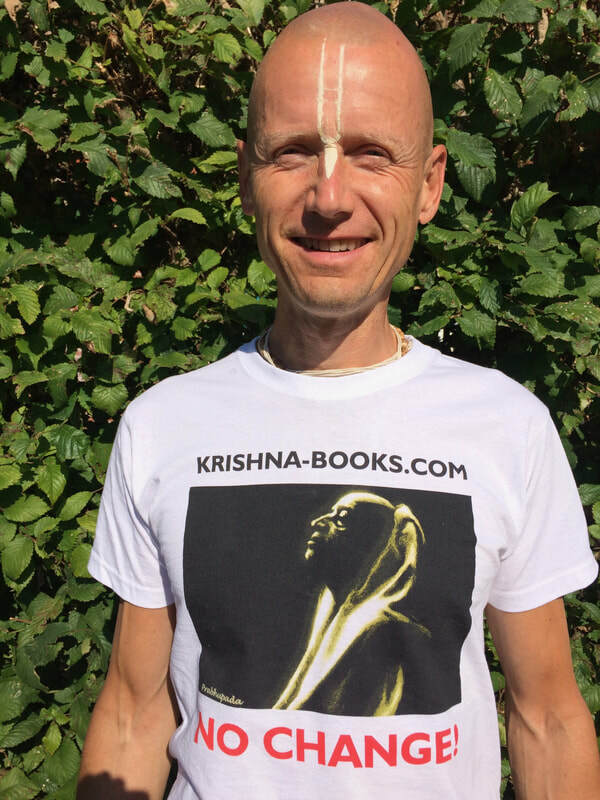 Recently BBT International (BBTI) and Jayadvaita Swami have been making public announcements about the importance of devotees buying books from the BBT exclusively. In this way they are indirectly saying that devotees should not buy books from Krishna Books Inc. (KBI) who distributes Srila Prabhupada’s original, pre-1978, books. To substantiate their claim they refer to a letter from Srila Prabhupada saying that all centers should buy from the BBT. There are several problems with the statements of BBTI and Jayadvaita Swami. "I want you to look at this because again you see where Prabhupada's original is superior to the edited version...."
"That's lost in editing for some reason....I don't know why they left all that out. I can't figure that out. Because it struck me as weird...."
"I just want you to notice in the original, that Prabhupada uses the phrase "big brain" or "best brain" all throughout this purport which the editors changed to intelligence, but actually Prabhupada uses it to some purpose here." The above comments appear between 5 minutes 50 seconds and 9 minutes 20 seconds of ​the audio. Srila Prabhupada said that we should not edit his lectures. Either we should publish the whole lecture, or none of it. BBTI don't seem to understand, that Srila Prabhupada didn't want post samadhi editing of his books, and they don't seem to care about his divine grace's instructions not to change his audio lectures either. 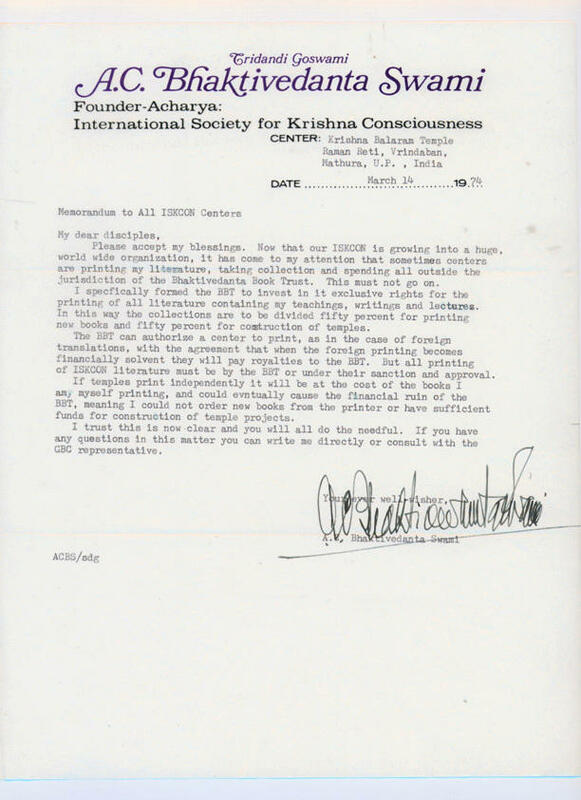 BBTi claims, that Srila Prabhupada is not the author of his books but only a hired scribe. Srila Prabhupada established the BBT in May 5th 1972 to secure that his books be printet and distributed widely around the world. In 1988 eleven years after Srila Prabhupada left us, BBTI was started, and the BBT was left as an emty shell as far as publishing and distribution is conserned. Please notice the small difference in the name (”international” or an ”I” added.) There is however a gulf of difference judicial and practically. 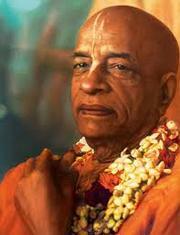 BBTI is not bound by, and do not follow all, the rules Srila Prabhupada made for his BBT. Are they responsible when Srila Prabhupada's books to be changed under their leadership? 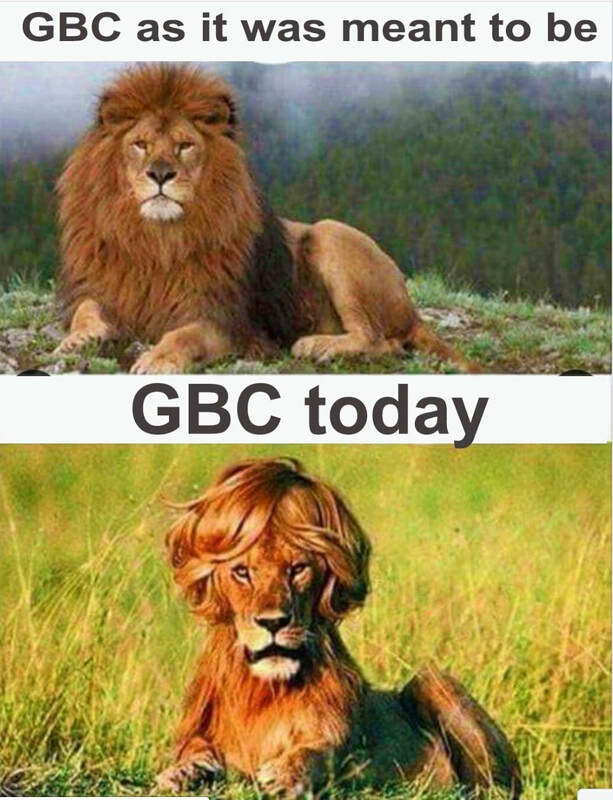 Therefore we have created these GBC. So they should be very responsible men. Otherwise, they will be punished. They will be punished to become a śūdra.Although Yamarāja is a GBC, but he made a little mistake. He was punished to become a śūdra. So those who are GBC's, they should be very, very careful to administer the business of ISKCON. Otherwise they will be punished. As the post is very great, similarly, the punishment is also very great. That is the difficulty. You can see from this example, Vidura. He was immediately punished. He did little mistake. Because the ṛṣis, the munis, they will curse. ISKCON published a new version of His Divine Grace A.C. Bhaktivedanta Swami Prabhupada’s book, Perfect Questions, Perfect Answers in 1993. It is a transcript of a conversation which took place in Mayapur, West Bengal, in 1972 with a Peace-Corps worker, Bob Cohen. Please read these changes completely as they give a very good insight into the types of things ISKCON and the BBT are deleting from Srila Prabhupada’s books. They have their own agenda and they want to change the philosophy that is presented in Srila Prabhupada’s books and by carefully studying the changes they are making you can gradually understand their demoniac agenda…. The original edition was more or less a transcript of the original conversation. It was edited, of course, to make the English clear and correct and to make it readable. But basically it remained a transcript of the original conversation. All the text has been heavily edited and the whole mood of the book has been completely changed. We have not done anything below about the editing, we have just pointed out a few pieces of text (shown in bold) that have been completely deleted from the new edition. Jayadvaita Swami is disturbed that we are chanting "Jay Prabhupada!" "The God says that 'Here is injustice, so you should fight.' God says that. God never says that 'I am God, Krishna. I am your friend. You sit down idly and I shall do everything.' He never said that. He said that 'You must fight.' That is our duty. Not that God has given us hands and legs and you sit down idly and let God do it. This is not devotion." Caitanya Candra Dasa and I have long wondered, why Lord Krishna and Prabhupada, allow the leaders of Iskcon, to destroy Prabhupada's Original books, against his will? We have come to a logical positive conclusion: IT IS A WAY FOR KRISHNA AND PRABHUPADA to separate, the sheep from the Wolves in sheep's clothing. Devotees totally reveals themselves, who is trying to save Prabhupada's Original books, and who wants Prabhupada's Original books destroyed and do not allow, the original books, to enter into Prabhupada own temples again. So with the devotee's own actions, Krishna and Prabhupada, very easily, can see which devotees, that deserves to be taken back to Krishna Loka !!! Written by Krsna Avatara prabhu. Many people just go with the flow, we have been told for many years, that we should just follow authorities, and that's a good sastric instruction, however sometimes authorities are wrong, as we've seen with the zonal acaryas, children being abused etc. and now the bookchange. When that happens, it is the duty of all followers of Srila Prabhupada to stand up and protect Srila Prabhupada's legacy. Srila Prabhupada states in B.g 4.34 P: " both blind following and absurd inquiries are condemned." Let it be know: You will fight for Srila Prabhupada's book.